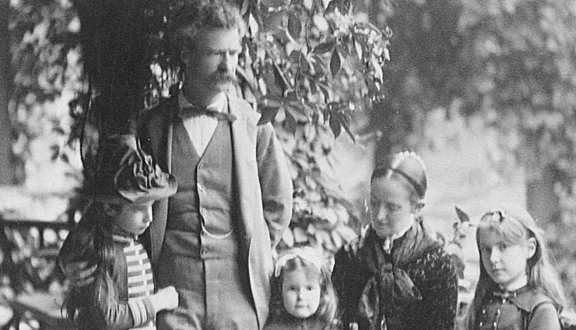 Mark Twain’s biographer Albert Bigelow Paine (1861-1937) says it was the first of the great man’s after-dinner speeches to be accurately recorded. The Humorist also manages to skewer journalists while praising women. Below is how the speech was reported the following day. Enjoy and Happy Mother’s Day, y’awl. Human intelligence cannot estimate what we owe to woman, sir. She sews on our buttons [laughter]; she mends our clothes [laughter]; she ropes us in at the church fairs; she confides in us; she tells us whatever she can find out about the private affairs of the neighbors; she gives good advice, and plenty of it; she gives us a piece of her mind sometimes—and sometimes all of it; she soothes our aching brows; she bears our children…… Ours as a general thing. Wheresoever you place woman, sir—in whatsoever position or estate—she is an ornament to that place she occupies, and a treasure to the world. [Here Mr. Twain paused, looked inquiringly at his hearers, and remarked that the applause should come in at this point. It came in. Mr. Twain resumed his eulogy.] Look at the noble names of history! Look at Cleopatra! Look at Desdemona! Look at Florence Nightingale! Look at Joan of Arc! Look at Lucretia Borgia! [Disapprobation ex-pressed. “Well,” said Mr. Twain, scratching his head, doubt-fully, “suppose we let Lucretia slide.”] Look at Joyce Heth! Look at Mother Eve! I repeat, sir, look at the illustrious names of history!